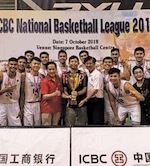 The FIBA Asia Cup 2021 pre-qualifiers First Round will be contested during the same second and third windows of FIBA Basketball World Cup 2019 Asian Qualifiers, in February and June 2018. 2 from GBA will qualify to the FIBA Asia Cup 2021 pre-qualifiers second round. They will play in two different rounds in February and June 2018. FIBA Asia Cup 2021 Pre Qualifiers (Men's) will commence from 26 - 30 June 2018. Top 4 teams from this competition will advance to Round 2 of the Pre-Qualifiers, which will be held in September 2018.